Veeam Backup & Replication launches the parent backup job by schedule. The parent backup job creates an image-level backup of the Oracle VM and stores this backup to the backup repository. A new session of the archived log backup starts. Veeam Backup & Replication accesses the VM guest OS to perform guest processing, collect database information and handle archived log. If Oracle runs on a Microsoft Windows server, Veeam Backup & Replication accesses the VM guest OS over a guest interaction proxy. You can instruct Veeam Backup & Replication to select the guest interaction proxy automatically or assign it explicitly. For Linux VM guest OS — using SSH. For Microsoft Windows VM guest OS — using RPC. If a network connection cannot be established, Veeam Backup & Replication accesses the VM guest OS over VIX. Veeam Backup & Replication also detects whether it is possible to store logs to the backup repository through a direct access or a log shipping server is required. The runtime process copies archived log files from the log archive destination (set by the Oracle administrator) to a temporary folder on the VM guest file system. Veeam Backup & Replication maps information about the Oracle system collected at step 4 with information kept in the configuration database. This periodic mapping helps reveal databases for which Veeam Backup & Replication must ship archived logs to the backup repository during this time interval. 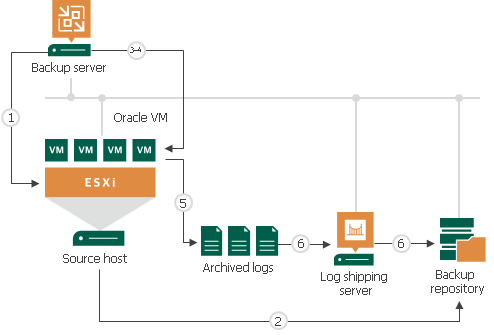 Archived log backup files are transferred from the temporary location on the Oracle VM to the backup repository, either directly or via the log shipping server. The source-side Veeam Data Mover compresses log data to be transferred according to its built-in settings. On the backup repository side, data is compressed according to the parent backup job settings. Archived logs that for some reason were not processed during the log backup interval remain in the temporary folder and are processed during the next log backup interval. To detect these remaining logs, Veeam Backup & Replication enumerates log files in the temporary folder. If a new session of the archived log backup starts and the parent backup job has not created a new restore point yet, the archived log backup job will remain in the idle state, waiting for a new restore point to be created.